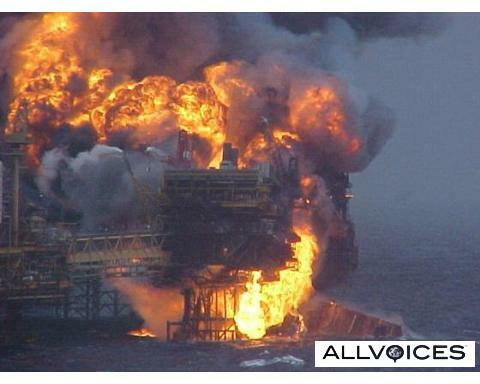 Black & White: Are we doomed with the uncontrollable oil disaster in Mexico? Are we doomed with the uncontrollable oil disaster in Mexico? If this engineer is right, this is truly a scary scenario! Here's his story. I'm engineer with 25 years of experience. I've worked on some big projects with big machines. Maybe that's why this mess is so clear to me. Now they've got a hole in the ocean floor, 5,000 feet down with a wrecked oil drilling rig sitting on top of is spewing 20 0,000 barrels of oil a day into the ocean. Take a moment and consider that, will you! We're so used to our politicians creating false crises to fo rward their criminal agendas that we aren't recognizing that we're staring straight into possibly the greatest disaster mankind will ever see. Imagine what happens if that oil keeps flowing until it destroys all life in the oceans of this planet. Who knows how big of a reservoir of oil is down there. That is correct, the oil reservoir under the gulf of Mexico is huge, that is the main reason BP and Obama will not allow the use of 'nuke' to seal the well off, they are still contemplating for the right moves in order to recapture some of the remaining crude oil in that reservoir, not cut themselves off from those oil fortune. If the leak continue, if means that they still have the chance to get majority of barrels inside the well since it is a very big finds under that dept of water. No way the British company want to place well-being of our environment or our earth at the top of their priority to stop this oil spill madness; even though it means further delay will has catastrophic outcome. Sigh! I cannot understand the foolishness and blindness of these people. They are also killing themselves and their children. That is incorrect, Justin! BP executives family are mainly British who happen to live far away from Gulf of Mexico,USA and so with Obama's children (in Washington D.C), how in the world the spill can affect them and their children, not only they didn't kill themselves, they hardly need to make a living from the gulf's water or eat the sea food from there; they are profiting from the oil fortune bury deep under the ocean oil well; not the clean water from the gulf or our ocean like the fishermen or shrimpers. It is quite a common trait you can find among company executives and high level government officials, known as "lack of empathy". Not only they are well and kicking since the oil leak, they are not being affected a bit in drawing their big salary each day. Actually most of the extremely deep ocean drilling is on experimental basic, all these claims by big multi- national oil companies that they possess advance drilling technology is just a way for them to bullsh*t the regulators in U.S.; see that the so called 'fail-safe' system and the 'blown out prevent-or' are just faulty devices use to mislead government agency that tasked with regulation. Even after 30 days since the explosion, investigator still has no clue how is that explosion is possible with all these safety devices in place on the drilling rig.....too many questions remain unanswered so far..
We are very close to doom day scenario if the big corporations are allowed continue to pollute our air and atmosphere with greenhouse gases, and then now move to the next phase of environmental destruction of our ocean, it is no doubt if our earth continue to take those beating, i am afraid to tell you then very soon only God can reverse this destructive course evil men lay down for us. Justin! The oil spill is not in Mexico, but gulf of Mexico. Man...... It is under the territory of United States of America. Obama want to have more off shore drilling and he is not convinced this oil leak is a norm in off shore drilling, he strongly believe it is just an aberration in oil industry, accidents like this don't happen often, so he refuse to withdraw all the leases on off shore drilling in the United States, i am sorry to disappoint you hoping to see Obama do something about uncontrollable oil disaster in the future, it doesn't sound alarming to him at all.